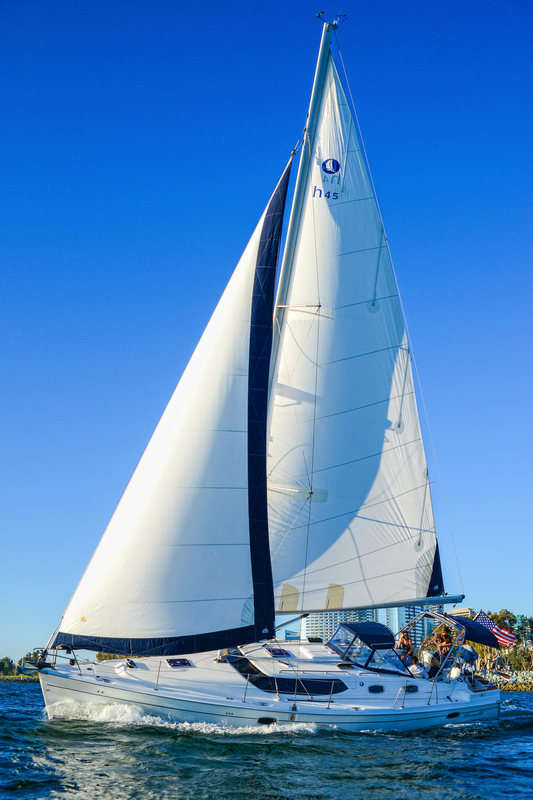 A Sunset Sail, our most popular option highlights all that San Diego Bay has to offer. You will be greeted by your captain and escorted down to the yacht where you can enjoy a cocktail in the roomy cockpit while your crew gets the yacht underway. Sunset cruises will typically leave Harbor Island 1.5 hours before sunset. Immediately after leaving Harbor Island, you will have spectacular views of the San Diego Skyline to port. On the way out to Point Loma and the Pacific Ocean, you will sail by Coronado North Island Naval Complex, the Sea Lion dock, the submarine base (NBPL), the Cabrillo National Monument, and the Point Loma Lighthouse. Once in the Pacific, you will have an unobstructed view of a uniquely beautiful San Diego Sunset. After the Sun tucks beneath the horizon, we will head towards Downtown San Diego with the changing colors of remaining sunlight off our stern and the city lights coming alive ahead (duration 3 hours). "My friends and I went out on a beautiful sunset cruise this last weekend and had the most incredible time! The boat was very comfortable and we loved how we could hang out on the front of the boat or the back deck throughout the cruise, enjoying drinks, snacks, and the beautiful scenery. Captain Brock was very helpful at pointing out interesting things to see and he took us to the perfect spot where I saw one of the most beautiful sunsets I've ever seen in San Diego. We also got to see sea lions up close on the bait barges on the way back, which were adorable. We all had such a great time and agreed that it was worth it! Definitely a 'must' for visitors, and even for residents of San Diego!" We were two couples that went on a sunset cruise. We loved the sail boat. I looked at many other charter options and this boat seemed like the nicest based on what I could determine from websites (roomy, well kept, new feeling, etc.) It was even better than I expected. There was plenty of room in the cockpit for 6 passengers plus 2 crew. There were 2 staterooms, 2 heads, and a full galley and dining table, not that we really went down below much. I brought a cooler on board with everything we wanted to drink and the makings for some great snacks. I used the galley's refrigerator and sink along with knives/cutting boards/silverware/plates/cups, etc to prepare quite a spread. We were celebrating a 65 year olds birthday so I wanted it to be special. We all had so much fun talking with Captain Brock and taking in the beautiful sights, I'm sure we will sail with him again next time we are in San Diego. The location and parking was convenient and the price was reasonable. "Fabulous luxury sailboat and even more impressing captain. From on deck to the boardrooms the boat was immaculate and clearly maintained by a professional. We had an absolutely fantastic afternoon sail, it was extremely comfortable and exciting. Thanks captain Brock, we'll see ya next time!!"